You have APIs, but are they working? "We compared API monitoring services and API Science came out on top. They gave us the right combination of advanced tools and ease-of-use to ensure our APIs are up and performing at all times. API Science has become an essential part of our stack." "API Science monitoring lets us know when something is wrong before our customers start calling. The monitors are very easy to setup and we're able to create multiple-step monitors within minutes." "We've moved our production API monitoring to API Science and have never looked back. API Science makes sure our public, partner, and private systems are all working as they should, and provides a framework that makes tons of sense for the modern API." APIs aren't just plumbing. They're critical to your business, your apps, and your reputation. That means you need to make sure they're always up, working and performing as they should. Don't let customers call you to tell you your API is down. Don't suffer bad app reviews because of slow or unreliable APIs. Traditional monitoring services were designed long before APIs became core to modern applications. API Science is designed specifically for monitoring APIs. Sure, we understand REST, JSON, OAuth, XML. No problem. Our worldwide API monitoring network lets you see how developers and apps really experience your APIs. You setup API monitors with your own tests. We then call your APIs (up to every minute) from around the world. If anything goes wrong we'll immediately let you know. Quickly identify performance issues, outages, errors. Troubleshoot faster and easier. We believe software is most useful when it gets out of your way. Our intuitive modern interface gets you up and running fast. Setup monitors quickly and easily. Get the most critical data right up front, when you need it. APIs can be complex. We can handle it. Do you have APIs that require authentication? Do you want to test real CRUD sequences in production? Simple GET calls not enough? We can handle any APIs you want to test. Do you rely on any third-party APIs? Are they up? Are they meeting their SLA? Are they down just for you? We can help you easily keep track of any services in your "API supply chain". Setup your own custom monitors or use our sample monitors to get started. Use our powerful reporting engine to get insights into historical trends, past issues, and to spot potential future problems before they bring down your apps. You decide how you want to be notified: Email, Slack, PagerDuty, HipChat, Campfire, and more. Use webhooks to build your own integrations, use threshold to minimize false alarms, and get notified when your issue has been resolved. 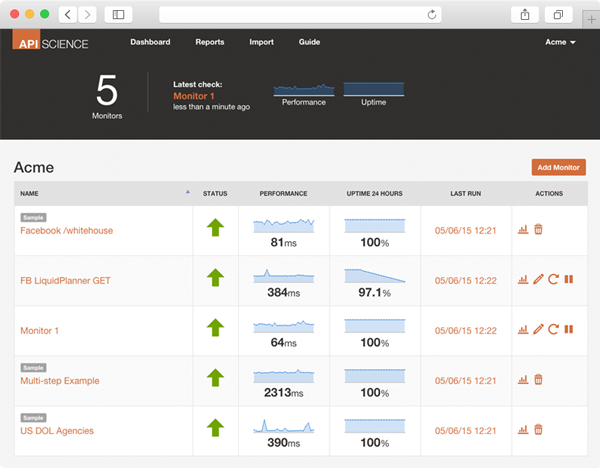 The API dashboard gives you a command center to check on the health of your API calls. Quickly filter onto API having issues, group monitors together with tags, and sort on attributes like response time. The API Science gives you a full featured REST API to do just about anything with your monitors via code. Automate the creation and updating of monitors, extract data, build your own API performance and uptime dashboard, and integrate with your own tools and consoles. Ready to get started? Read the full API Documentation. Easily test and monitor your own APIs and the third-party APIs you rely on. API Science tools can help save dev time and reduce frustration. Quickly see if internal APIs pass automated continous tests, see if external APIs are really down or down for just you. Testing modern applications also means testing APIs. Often the root cause of bugs and issues are internal and external API dependencies. Run one-time and continous tests to monitor them and find issues fast. APIs are often the weak link in the chain of today's mobile and web applications. Quickly identifying and addressing production API issues is critical. Our tools gives Ops teams the tools they need in the new API-driven world. One of the stealthy trends in business computing is the gradual rise in reliance on APIs. Almost every digital interaction involves an API being called to gather data or invoke some key action. You can’t play Words with Friends without APIs and WalMart cannot run its vendor-managed inventory without them either.